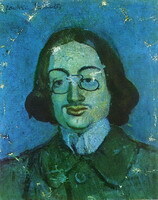 Jaime Sabartés (June 10 1881, Barcelona – February 12 1968, Paris) was a Spanish (Catalan) artist, poet and writer. 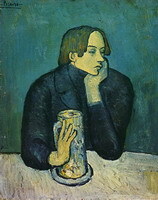 Sabartés had been Picasso’s close friend since he was 8, and later became his secretary and administrator. 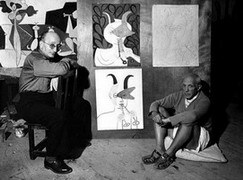 According to Francoise Gilot, Sabartés was a cousin of Joan Miro. He studied fine arts and sculpture since 1901 and was writing poems and prose under the pen-name Jacobus Sabartés. Jaime Sabartés was a member of Picasso groups in Barcelona and Paris; he regularly appeared in the famous Parisian café “Four cats”. In 1904 he moved to Guatemala with his uncle, a businessman. 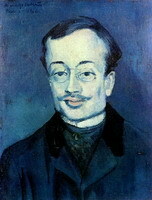 Sabartes was married in 1908; his son Jesús was born in 1914. In 1912 he moved to New York, but returned to Guatemala a year later. 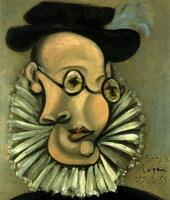 He was engaged in the organization of exhibitions dedicated to Picasso and other artists, taught at the Academy of Fine Arts and was the chief editor of “Central America”. In 1927 Sabartes returned to Barcelona to provide treatment for his son. He and his wife parted in 1928. 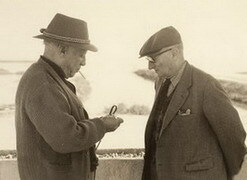 In 1939, Picasso asked Sabartés to come to Paris in order to assist him in his work. Thus he became an administrator, a secretary, an exhibitions organizer, and an assistant of his longtime friend. During their joint work Sabartés had amassed a huge collection of paintings by the artist, which was handed over to the Picasso Museum in Barcelona in 1963 and was the main core of the exhibition. Books and documents were handed over to the Málaga Museum. In 2007, a square in Barcelona was named after Sabartés.